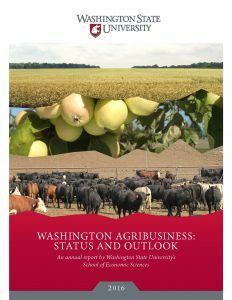 Washington Agribusiness: Status and Outlook 2016 is the inaugural issue of a new annual publication. Produced by WSU economic sciences faculty, it examines the opportunities and challenges facing Washington agriculture. Each issue will come out in January and will provide an update on Washington’s major sectors, including wheat and barley, specialty crops, tree fruit, beef, and dairy, as well as feature articles on specific issues unique each year. A major focus this year is on the Trans-Pacific Partnership trade agreement currently awaiting action by the U.S. Congress. In his article, “Status of Washington Agricultural International Exports,” writer Andrew Cassey highlights the importance of trade to Washington agriculture and discusses potential impacts of the trade agreement. Writer Randy Fortenbery gives the small grains economic forecast in his piece “Situation and Outlook for Small Grains.” In addition, there are two interesting articles that review the results of recently completed research projects that focus on the beef and hard cider sectors in Washington. Executive editor Randy Fortenbery, who is also a professor in the School of Economic Sciences, intends Washington Agribusiness: Status and Outlook 2016 to provide a concise summary of the issues facing Washington agribusiness. Timothy Nadreau, managing editor, welcomes suggestions for future content. He can be reached at timothy.nadreau@wsu.edu.